Young, yet skilled Pneumofore mechanical engineers with international experience covered the entire Glassman exhibition in Guadalajara on 22 and 23 October in Mexico. 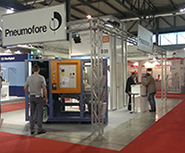 No other supplier of vacuum pumps or air compressors did participate in this event, Pneumofore keeps its exclusive leader position in the worldwide hollow glass community. The Pneumofore presentation shown on 23 October and available on the Glassman site did generate interest enough to motivate Mexican glass producers to cross the Atlantic and come to visit our headquarters in Italy, so here we are to continue the successful and good times with our friends. 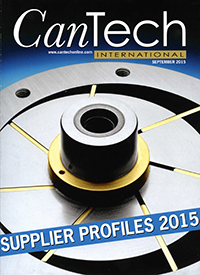 The yearly ‘Supplier Profiles’ edition of the prominent industry magazine CanTech International edited in UK by Bell Publishing shows the historical, yet actual preferred picture of Pneumofore. The rotary vane section is beautiful to look at, many are fascinated. Technically speaking, it contains relevant information like aluminium vanes, tangential cuts and oversized bearings; clear statements of proper dimensioned engineering for extraordinary durability. 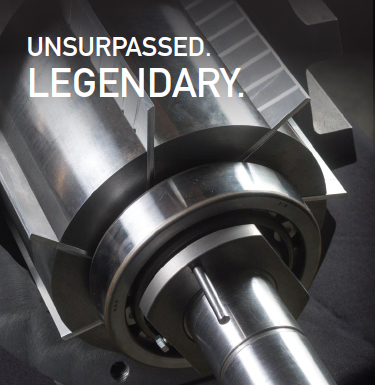 Pneumofore is a legendary supplier to the can industry with old records and still covers the pole position of technically advanced air compressors and vacuum pumps. The continuous running in two-piece can production lines allows to compare the Total Ownership Cost of different equipment: any comparison with screw compressors or vacuum pumps over 10 years results in favour of Pneumofore. Finally, the expensive to buy but cheap run Pneumofore machines are more economical, this is proven in plants spread over five continents. Pneumofore thanks for the honour to be mentioned as key-supplier to the international can industry community. Exactly today starts the Asia CanTech Conference in Bangkok, our Sales Engineer Mr. Francesco Amati will present ‘Vacuum and Compressed Air Solutions for Cans’ within the conference programme. The 3rd Annual Global Forum on Pipeline Maintenance and Integrity Management in Berlin, brought together technical and strategic leaders from major O&G Companies, Pipeline Owners/Operators, Refineries to get together on a platform for discussion about the challenges associated with latest standards & certifications, ensuring social & environmental responsibility and achieving cost-effective operational excellence by utilizing innovative inspection & maintenance strategies. Pneumofore participated in the person of Eng. Daniel Hilfiker with the presentation ‘Pipeline Drying – Latest Innovations’. Vacuum instead of hyper-dry compressed air or nitrogen to dry pipelines is now highly appreciated due to the shorter drying times, minor capital investment, reduced footprint, ease of operation. A successful field for the exclusive UV H vacuum pumps, able to evacuate 127 kg/h of H2O with model UV50 H.
In a world, where many buy cheap and pay much more later, Pneumofore stands out and promotes the opposite idea: to pay more in the beginning, and to pay much less on the long term. This rule has been mentioned by the technical manager of a leading European glass group visiting our headquarters: ‘10% to buy, 15% to service and 75% to run. This is the cost of compressors over 10 years’. Guests of such caliber with vast experience and unsurpassed competence, do understand. They do not waste time on selling price negotiations, they focus on the specific efficiency on the long term. Negotiations refer to penalties for efficiency loss, not to commercial aspects of the deal. All this in view of real economical considerations regarding the Total Ownership Cost, with the priority of minimal environmental impact. These facts correspond to basic values of Pneumofore and are more and more appreciated, worldwide. The positive response from the Pneumofore participation at Asian exhibitions and conferences in 2015 projects a bright future and motivates us to invest further. So far this year, during Glasspex India, China Glass, Cannex & Fillex and Propak Asia we met several new contacts, customers, agents and partners. At the base of our success are the tropicalized compressed air and vacuum systems, numerous references since 10+ years of trouble-free operation. 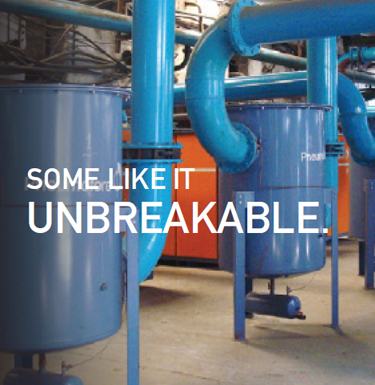 On the fertile ground of booming economies, we kept the rigorous Pneumofore engineering approach to install exclusively state-of-the-art machinery, within a correctly engineered project frame. Centralization is becoming a working standard also for mid-size food or packaging plants. High humidity in the atmosphere makes most European and American thermodynamic machinery inadequate. Dedicated solutions with tailored installations allow important operational cost savings and we enjoy meeting friends who experienced huge improvements and openly declare their total satisfaction. This is the case in the Middle East and in Asia. In Western countries, we experience more hesitation to invest in industrial equipment with a long-term view of 10+ years. Every project starts on a solid foundation. Here we rebuild the entire testing area to install, among others, the latest flow measurement devices. Driven by the widely spread false data declarations in the market regarding efficiency and durability of industrial air compressors and vacuum pumps, Pneumofore invests towards higher transparency. The measurement of capacity is a grey zone which deserves attention. Our idea is to declare data which is singularly and practically measured with normed and certified instrumentation. The new testing area is equipped with a 10 tons crane and is ready for the enlarged range of Pneumofore twin machines with UV100, A520 and A800 up to 640 kW single unit nominal power. Early July 2015, two more UV50 vacuum pumps were successfully commissioned in Eskisehir. The engineering collaboration has been excellent, the entire vacuum piping system was prepared exactly according to our layout. The ambient is very well ventilated with 20° C temperature only. This installation follows three older UV50, all equipped with variable speed drive, which were put in operation in 2012. Pneumofore observes with pleasure the further investment of the Sisecam Group in Turkey after having delivered numerous vacuum systems to Sisecam-Ruscam plants in Russia. The first supply for the Sisecam Group happened in 2002. It took 12 years to motivate Pneumofore and participate to this important event again. Simply, the market is now mature to listen carefully our ‘centralization of vacuum’ stories. Having one central vacuum system in a food processing and packaging line was rare, in 2005 some innovative European high-tech factories first implied centralized, double vacuum level. New regulations for cold rooms, CIP requirements, long-term operational cost analysis, human friendly environment and more have changed the way food companies work today. Pneumofore is ready with the UV50, the world’s largest rotary vacuum pump with air-cooling displayed at our booth. With 2700 m3/h, 75 kW nominal power, vacuum max. 1mbar(a), single-stage, this machine has no competitors, especially in its H version for water vapor suction, up to 181 kg/h of H2O. During the entire show, visitors could observe this water-evacuation-phenomena in nature, as the demonstration of water put in the UV8 H inlet was done repeatedly with large vapor clouds at the exhaust. Pneumofore references are found worldwide in, or beside, the food industry, as we cover many applications, like moulding of glass containers, aluminium can production, animal evisceration, meat drums, EPS, vacuum freezing, vacuum baking, packaging of sliced meat, cheese processing and packaging, pasta degassing and several more. We have the severe imprinting of precise Swiss engineering but our demanding taste in food and lifestyle makes us love Italy, the undiscussed capital of good taste. 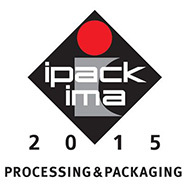 The Fieramilano is hosting the Ipack-Ima exhibition from 19 to 23 May, Pneumofore will be present in Hall 3, Booth B59. Due to the nightmare of many factories regarding vacuum-troubles, most of which Pneumofore is familiar to solve worldwide, our machines will be shown in nature. The UV8 H will be used to practically show the suction of water vapor, the demonstration will find place every two hours. Centralizing vacuum brings immense additional advantages to most large packaging industries. The idea is to avoid countless small and problematic on-board pumps by installing few serious and industrial machines, specifically designed for the evacuation of water vapor in the packaging of food. Also production of packaging material, like carton, EPS, glass containers, thermoforming of plastic or aluminium cans do rely on vacuum. 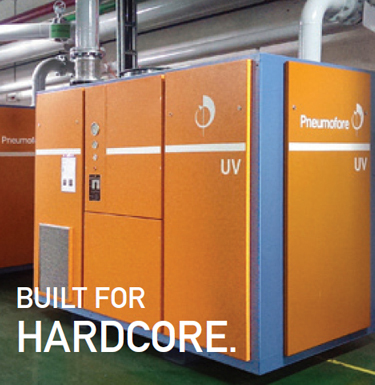 Actually Pneumofore counts more than 260 different processes covered with UV pumps in the packaging industry alone. Come and visit us, remember to jump also into the world Expo in Milan. Heat is energy and considerable quantities can be recovered from industrial machines. Heat is the ‘waste’ of a thermodynamical process as observed in compression of air and gases. 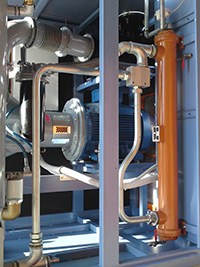 The Pneumofore units are famous with air-cooled solutions in tropical countries, in areas where there is no water. With rising environmental awareness in Europe, more frequently we supply also units with Water as second cooling media, preferably in Scandinavia, where the heated water is mostly used for heating purpose. The machines will maintain their operating temperature with a constant water flow. The switch from water to air is automatic in case of lack of water. The operator can select Summer or Winter mode whenever warm water is required. The HR Heat Recovery on UV pumps and A series Compressors is available as option since years. For the proper cooling system dimensioning we ask temperature and pressure values of the cooling media In / Out and we quantify the recoverable energy in BTU. 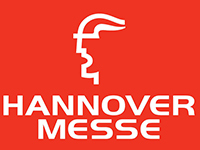 Next week you find us at ComVac, the world’s largest happening for compressed air and vacuum technology; this traditional event is hosted by the Hannover Fair in Hall 26. The last two years since its past edition have been fruitful for Pneumofore with amazing innovations: the A400 is the biggest air-cooled rotary vane air compressor with 315 kW for pressure from 2,5 to 10 bar(g), as twin unit this compressor becomes A800 with 630 kW. The UV100 is the novelty in the vacuum division with 6480 m3/h capacity, vacuum from 450 to 1 mbar(a), air-cooled also in hot climate, with an impressive capacity to evacuate humid air up to 214 kg of water per hour. The Pneumofore appearance is almost a ritual, being one of the oldest family-owned companies active in this industrial sector. Direct, fresh and dynamic are qualities of our communication, gadgets and eye-catching animations backup the Pneumofore presence and promotion. When a marketing consultant asked Pneumofore’s CEO: ‘If Pneumofore was a car, what would it be’? The answer was clear: ‘ A Kamaz winning in the Paris-Dakar race’. The reference is not made to the other famous car and motorcycle race participants, popular brands seen daily on the streets. The Pneumofore reference is the Kamaz 4326, 1000 HP, 16,5 liter turbo-diesel V8, winner of 11 of the 13 last Paris-Dakar races; the winner who dominates the truck category year after year. Like the rugged and indestructible Kamaz, in industries depending on vacuum and compressed air for process and product quality, Pneumofore’s rotary vane machines stand out as the robust champions of capacity, performance, reliability and high efficiency. With Rexam, Crown Cork and Ball among the Pneumofore customers, in 2015 we invest again in events related to the worldwide can industry, as we also target other manufacturers of this industrial sector. From 23 to 25 March you will find us at the Euro CanTech in Barcelona, Spain. Ipack-Ima is the following happening in Milano from 19 to 23 May; not meant for cans only, this exhibition includes all packaging areas. If you intend to visit Ipack-Ima, please note that it is contemporary to the world Expo in Milano. Cannex and Fillex is the Chinese event of the year, from 1 to 4 June in Guangzhou. The filling application is sometimes immediately subsequent to the can production and is also part of the Pneumofore field of competence, with Sab Miller as major customer. Propak Asia from 17 to 20 June in Bangkok is the other packaging fair with Asian audience and Pneumofore participation. The last conference of 2015 exclusively dedicated to cans is Asia CanTech, in Bangkok from 26 to 28 October. May one of these events be on your schedule, so that we can meet to discuss important improvements in your can production lines. Our dedication to hollow glass industry is historical. The Pneumofore equipment is constantly improved to match latest performance and sustainability criteria of this demanding application for superior air compressors and vacuum pumps. Several large bottle producers have direct contact with our headquarters, still we invest in wide marketing presence at major events. Starting this year, Pneumofore is member of GIMAV, the Italian manufacturers’ association of machinery, accessories and special products for glass processing; our worldwide participation to glass exhibitions and conferences will be increased and simplified. Look for Pneumofore in the Italian GIMAV pavilion at China Glass, Mir Stekla, Vitrum and Glasstech Asia. We will be pleased to meet you also at Glasspex India and Glassman Europe. Fair details are found in our Trade Shows Section.